Thankfully January is finally over! My two daughters are away at university and came home for a visit this weekend, which I really enjoyed. I miss them terribly, the house is just too quiet and tidy! My oldest daughter asked me to make a fun birthday card for her to give to her friend when she goes back to school and of course I was happy to do it! After I discovered the friend is a collector of all things 'frog', I decided to use my "Unfrogettable" stamp set by Stampin' Up! It's a retired set but I found it on ebay and scooped it up. 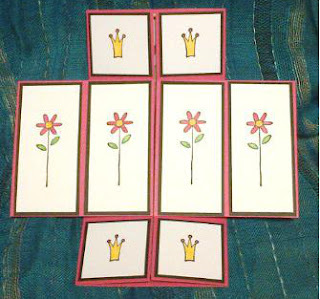 It's the perfect set to use to make a forever or never ending card so that's just what I did. For those of you who have never seen one of these cards it's really neat, you open it and just keep opening until you end up where you started! Crochet rocks!! 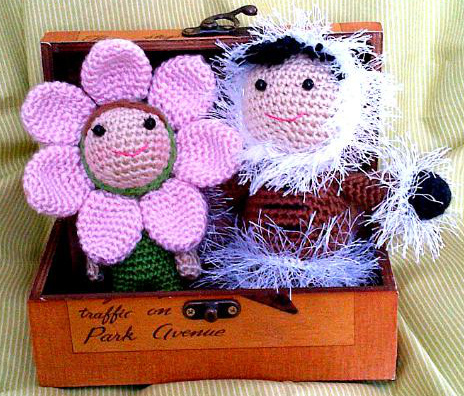 I made these characters from patterns I purchased on http://www.etsy.com/, a site that is really worth a visit! 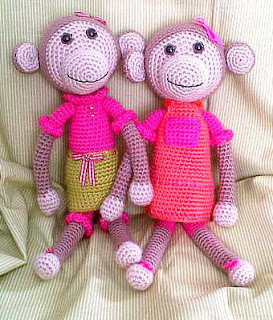 The monkeys are crocheted from a free pattern I found on the internet a few years ago and for the life of me I can't find the source. Sorry to the original pattern designer, I love this pattern! If anyone finds out who it is let me know and I will edit this post to include her name. This ty pe of crochet is done in rounds with a single crochet stitch, which by the way is the only stitch I know how to do! I had a neighbour behind our house, Mrs. Snell, who was my go to person when I got stuck on a pattern. She moved into a retirement home a few months ago and I really miss running through the backyard in my slippers dragging yarn behind me to get her help! These projects are quick to make which suits my short attention span just fine! I do tend to jump from media to media, but 'fibre art' is where I am most comfortable. Paper, yarn, basket reed, fabric, floss, thread......oh the possibilities are endless! I have to do some house work and grocery shop today which is seriously cramping my crafting time, don't you just hate it when that happens?! Good afternoon everyone! 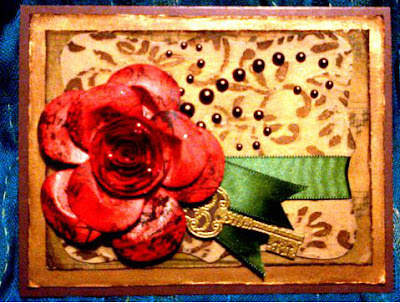 I had a late night card craftin' and experimented with punched flowers til 2:00 a.m., and made this distressed rose card. 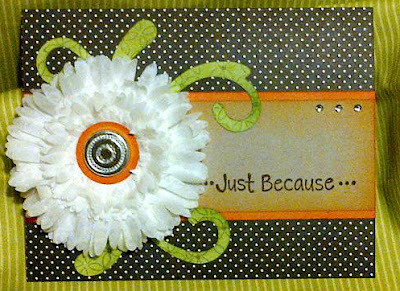 I was inspired by valitasfreshfolds.blogspot.com, Valita uses Stampin' Up! 's Owl punch to create roses and I've been itching to give it a try! I love using punches in a way they were not designed to be used and you would never suspect the petals of this rose where once little owl punch outs! It's made by punching 8 owl shapes, cutting off the little feet, splitting the head open and gluing it together to form a cup shape. Sounds gruesome! The inner part of the rose is a 2 3/8" scallop circle cut into a spiral and rolled up using tweezers or a quilling tool. I punched the rose out of patterned, off white, light weight card stock and inked with Fired Brick Distress ink. 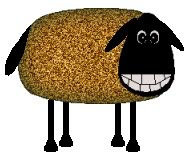 The background was once a box of Special 'K', which has been die cut with SU! 's Top Note die then embossed with an all over flourish pattern. After painting it with Sunflower acrylic paint, sanding and blending with Walnut Stain Distress ink one would never know it was once my fav breakfast cereal! It's the year of the Dragon, and I'm Dragon so this should be great year! I made and posted a card similar to this one a few posts ago with some homemade alcohol ink. 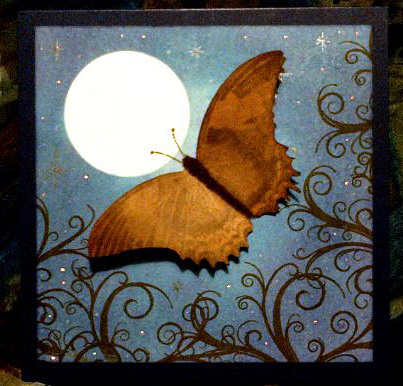 This card is made using a large Martha Stewart Butterfly which I thought would make a good lunar moth. I punched a moon and masked it off then inked the background with Tumbled Glass, Broken China, Faded Jeans and Dusty Concord Distress inks. The border is stamped with Hero Arts Flourish Tree using Walnut Stain Distress ink and the sky is speckled with a combination of Pewter Perfect Pearls and Diamond Stickles. It really sparkles against the dark background. Happy Chinese New Year to everyone and may this year bring you health, wealth and happiness!! Rainy, snowy, miserable, January day here in the Heart of the Ottawa Valley today! I was lacking inspiration so I did some blog hoppin' and was inspired to create this faux leather handbag with a cat inside. It is a homage to Ellen Kemper, who is probably the best punch art artist in the known world and Ali from alicardmaking.blogspot.com. 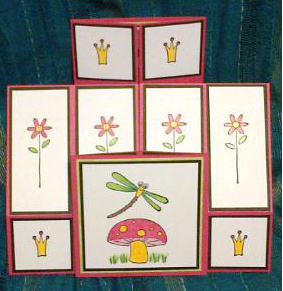 As a card maker there is no greater pleasure for me than to see one of my card making ideas used as a jump of point for someone else to create their own piece. 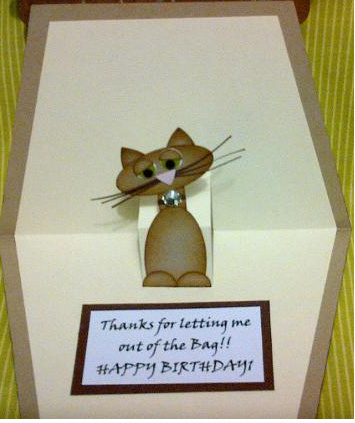 So thanks Ali and Ellen for your inspiration, a card is born! I've been wanting to experiment with faux leather finishes for a while now, this is my first attempt. I embossed the handbag with the Diamond pattern embossing plate from Stampin' Up!, then used Tea Dye, Vintage Photo and Walnut Stain Distress inks to create the leather look. 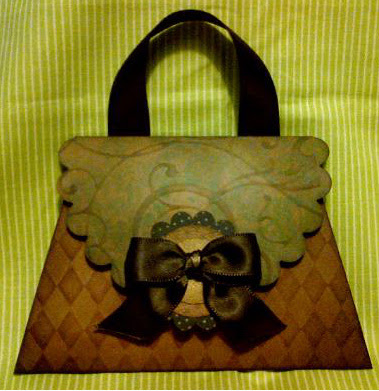 The purse top is a large Spellbinder Scallop circle, cut from K & Company, Life's Journey paper. It started of as a tourquoise floral print, but after embossing a swirl/flourish and inking with Distress inks it looks more like coloured leather than paper in real life. I cut a 1" little perch for the punch art cat (thanks again Ellen! ), and added a sentiment I created with viner font on my 'puter'. Meow. 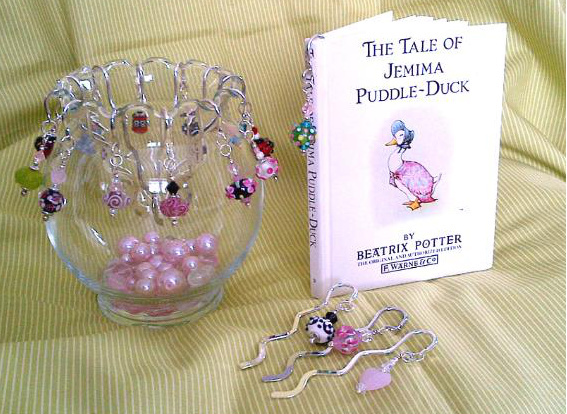 This is a great way to read in style, book jewellery! I guarantee if you have one of these stylish bookmarkers holding your page it will grab the attention of those around you! They are slim and not only work well but look beautiful at the same time. It's a good way to use those stray miss matched single beads that are left over from other projects too. 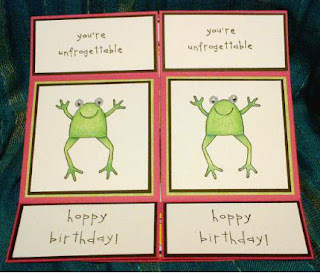 I often tuck them into a hand made card as a small gift, they fit perfectly. This will be one of the pieces we will be making in my upcoming Introduction to Jewellery Making class, this coming spring. I have a few teachers to say, 'thank you' to this year, so I made this little pencil card yesterday as my first attempt. I am planning some youth classes this spring as well and this card would be perfect! It teaches: using a template, bone folding, using several differents types of adhesive, punching, crimping and setting an eyelet. It doesn't look that complicated does it? I'll post some more teacher cards over the next few weeks, stay tuned! I love House Mouse stamps, they are so cute! It's so cold out and we have so much snow that I felt the need to make something 'summerish', and after rifling through my considerable stamp collection I settled on this one, and I'm glad now that I did. I coloured him with Prismacolour pencil crayons and odourless solvent, blending with a cardboard blender, which has become one of my favourite colouring methods of late. 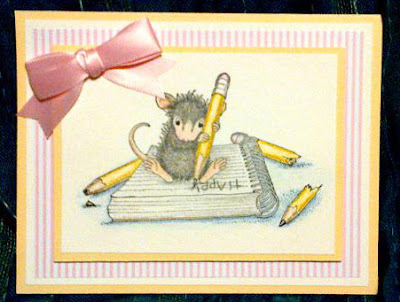 The page the little mouse is writing on is actually blank so you can pencil in your own message, I chose 'Happy Birthday', or at least part of it! Well I'm off to let the dogs out, last time I did it earlier today, I had just washed hands and I touched the door knob and froze myself to the door!! I did a little experiment today, I made my own fun foam rubber stamp. I die cut two flourish shapes out of fun foam, stacked and adhered them to another piece of fun foam. 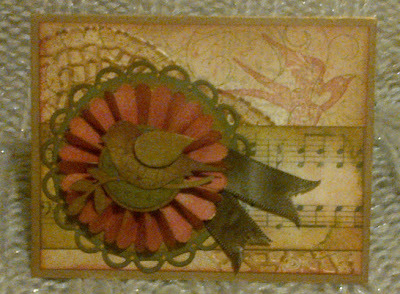 I stamped the background of this little bookmark with my homemade stamp and Versamark ink, added some antique gold embossing powder and heat set it. I'll bet if I never told you that's how I made it, you'd have never guessed it! I inked the background with Broken Dishes and Vintage Photo Distress inks, water splotched, added an embossed medallion and two birds using SU! Two Step Bird punch. The dots are Distress Stickles in a brown shade, sorry forgot the name, finished with a sheer brown ribbon tie. Oh ya, almost forgot, my new Distress inks finally arrived today!! I got 8 new colours, so tomorrow will be a 'craftroom day' for sure! I made this card today out of, you'll never belive this, dollarstore fake Sharpie markers! Step 3. Soak the ink tube and nib in the alcohol for about 10 mins, remove them, and give them a squeeze so you get all the inky goodness out! Step 4. Transfer ink into an air tight storage container and it's ready to use! I used my Distress Ink blending tool and a felt blending pad, both of which are homemade, I'm getting cheap in my old age, to apply ink by dabbing and swirling onto background. 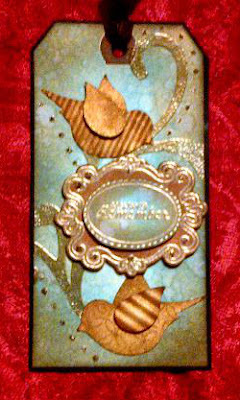 I stamped the border with Hero Arts Tree Flourish background stamp in Vintage Photo Distress ink, then blended the same ink around the edges. I stamped a Martha Stewart butterfly in Vintage Photo and inked it with Peeled Paint, Broken Dishes and Concord Grape Distress inks. 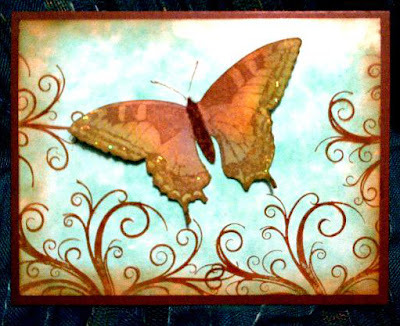 I cut the butterfly out, flocked the body in Reflections brown flock and mounted it on card after stamping image on card in Vintage Photo. Whew, that was a mouthful, now, I'll be up all night taking dollarstore markers apart!! It's a sweltering -30*c outside today, but at least the sun is shining and it stopped snowing! I decided to photograph this tote outside in the sun and I'm glad I did, it really shows the colors well. This tote is woven from 5/8" flat rattan reed, and the handle is wrapped in 1/4" wide reed cut from the outer shell of rattan. It almost has a 'tortoise shell' look to it. The rim is made from 5/8" flat oval, packed with #3 seagrass and wrapped with #2 round reed. I will be teaching basket weaving later this spring/summer so stay tuned! 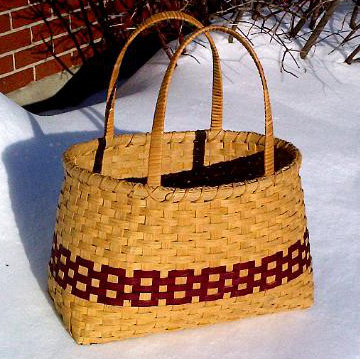 I would like to do a weekend workshop when the snow melts, on natural basketmaking. We will start it off with a little field trip to cut the materials we will need. Should be a fun weekend! I'll post pictures of the upcoming basket projects in a few weeks. 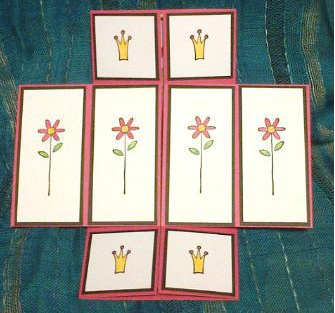 Hey gang, just a quick post to show you all the bookmark we are making the night we do the Four Flower Card. It features Tim Holtz Distress inks in Broken Dishes, Peeled Paint, Fired Brick and Vintage Photo. It will give everyone a chance to get familiar with the new tools, blending techniques and 'water splotching'. I used a Sissix flower die to cut the felt flower and I learned a cool new way to add jute string to buttons with no knots or bulk behind the button that we can try. 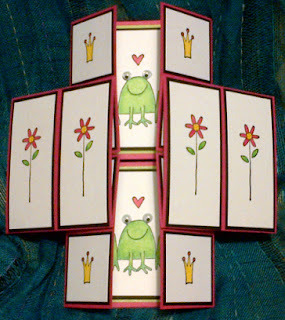 This bookmark is based on card by Jennifer McGuire, a designer for Hero Arts and Ranger, and was featured in her "Thinking Inking" course, which I really enjoyed. I can't wait to share these new inks and card making techniques with you! We're in for a fun night!! For those of you who won't be able to join us, I'll post the pictures and maybe we can get together soon for a card night! First I have to give a 'shout out' to all my followers in Toronto!! Sorry I couldn't come to visit this time, but I promise to come for a visit this summer. I hear Alicia is interested in art, you go girl!! Quilling has made a comeback, not that it ever left, but today's quilling can be modern and fresh as well as floral and Victorian. This little introduction to quilling card features a few key skills that are necessary to develop such as coiling and how to reproduce uniform shapes needed to create flowers and characters. The flower on this card is made from 1/8" wide x 8" long strips of melon pink quilling paper, coiled then pinched into tear drop shapes. 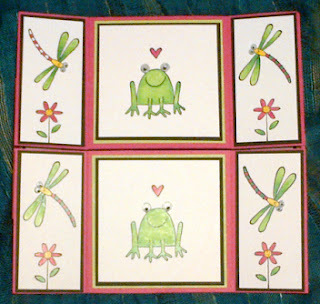 Those of you who will be joining me for an evening of card making (lucky ducks! ), will also learn my secrets of how to make your own quilling board, tool and measuring gauge! I just can't get enough of my new Distress inks, the possibilities are endless! In fact, I just ordered a few more so stay tuned. Our mail carrier is going to think I'm a nut because I run to greet her everytime she comes to our house! 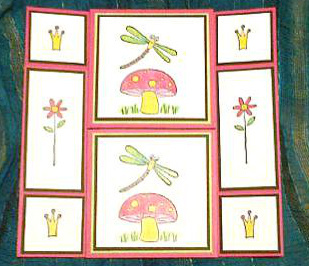 I made this card using Hero Art's Flower text stamp, it' the most huge wood mounted stamp I own. It measures 5 3/4" x 4 1/2", told you is was a giant! 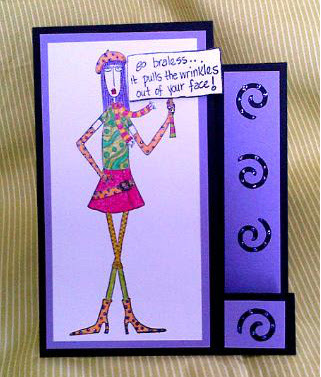 I love it because you can use it as a background stamp or feature the art work like I did on this card. I used Stampin' Up! watercolour crayons to create the background by mixing several shades of blue for the sky and several shades of green for the grass, then used my homemade "shimmer smoochlike spray" to add speckles. The image is stamped in black Stazon, then inked like crazy with Peeled Paint, Broken China, Spiced Marmalade, Fired Brick and Concord Grape Distress inks by Ranger. I felt it was a bit dark, so I used a white gel pen to add some highlights and dots. I can't wait for tomorrow's mail to come! Well, it's January and like most people this time of the year budget is key! I happened to go to our local Dollarama and when I walked past the coffee filters an idea struck me...flowers of course! I made this flower using Stampin' Up! 's Daisies 2 XL die, and coffee filters. I saw some white paper flowers at the craft store last week and ended up using my will power and didn't buy them, but the idea just wouldn't go away! So, I did the next best thing and made them my way! I have to say I really like it and will definitely try this again! I used Distress Spiced Marmalade to sponge the edges of the center panel and flower center, finished with a Peeled Paint flourish, and viola a card for all of $0.25! Got to love that! 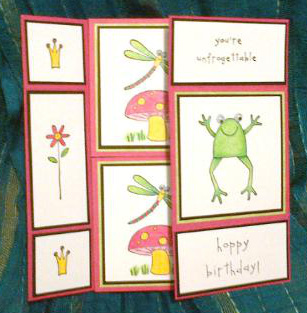 You will never believe this, but I only used 2 colours of cardstock to make this card, black and vanilla! 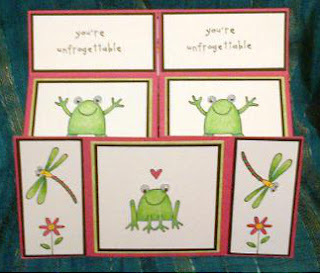 The beautiful colours are thanks to Tim Holtz and the folks at Ranger! I am lovin' my new collection of Distress inks and I challenged myself to see how many colours I could use on one card, grand total, 7!! The card base is a 5 1/2" sq black card. The first layer is a 5 1/4" sq piece of vanilla cardstock that has been sponged with Spiced Marmalade and edged with Vintage Photo. The next layer of believe it or not, vanilla cardstock, has been stamped with a swirly flourish, embossed with clear embossing powder then blended with both Peeled Paint and Broken China. 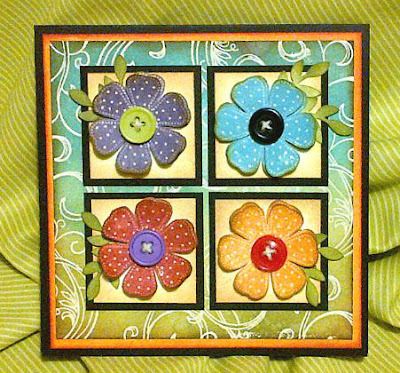 The squares under the flowers are black 2" and vanilla 1 3/4". The vanilla is edged with Tea Dye. The flowers are stamped in Broken China, Fired Brick, Concord Grape and Spiced Marmalade and edged with Vintage Photo. 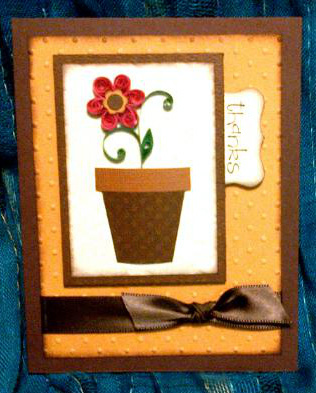 The leaves punched using Stampin' Up! 's Two Step Bird punch are from,you guessed it, vanilla cardstock, then sponged with Peeled Paint. I topped off the flowers with some buttons, and voila, a colourful card make from black and vanilla card stock! Well, we've had the flu go through our house over this past week, and it sucked. So needless to say I haven't spent much time in my craft room, but I was feeling a little better today and managed to make a few cards. I tried out my new Distress inks that I got for Christmas and they are awesome to play with! I used Tea dye, Vintage Photo, Peeled Paint and Fired Brick on this card. The pleated medallion is topped off with Stampin' Up! 's Two Step Bird punch. I also printed the music paper from a sheet of decorative paper and have to say I would definitely do it again. It's inexpensive and I'm happy with the results! I plan to have a 'pajama day' tomorrow and craft for the whole day, I can't wait!! Let's face it, crafters are hoarders! I live by a rule my quilting guru told me 20 years ago, "save it, if it' s bigger than a bear's nose!". I'm always looking for good ideas to put all the left over bits and pieces to good use. This card does just that! 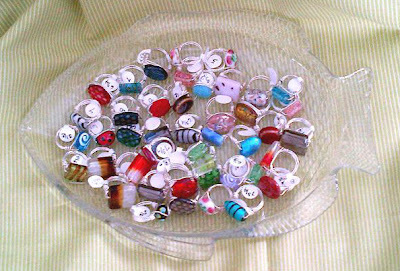 I used a plastic ring that I purchased at our local fabric store and tied scraps of ribbon around it until it was full. Fold ribbon in half, wrap loop around ring and pull the tails through the loop. 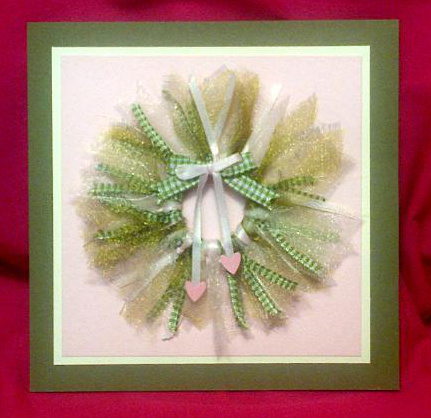 I used my glue gun to adhere the wreath to the card. Now if I make 10,000 more of them I will make a dent in my scrap box! Have you "tangled" yet?! 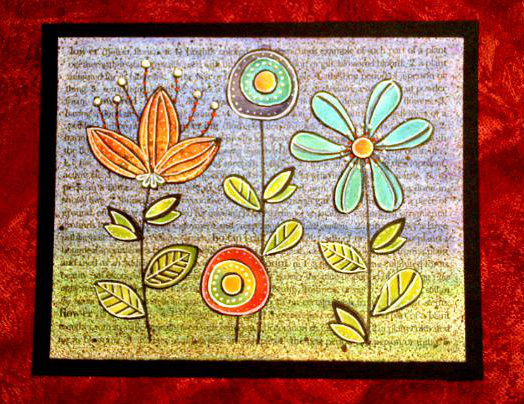 Zentangle is the latest craze to hit the arts/craft world! Apparently it goes like this, Zentangle is the noun and tangle is the verb. So I spent the afternoon tangling and tangled this card! 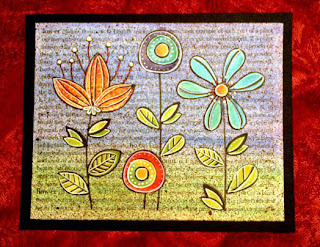 Zentangle is doodling with a fine tip black marker to create patterns, usually on white paper. 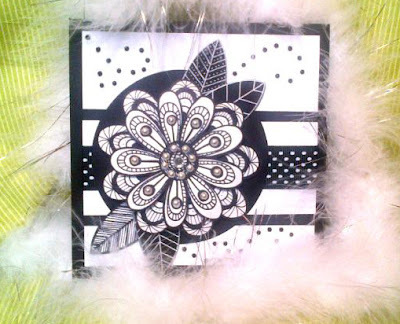 There are official patterns which I plan to try but for this card I stamped a large flower and doodled it with black marker. I haven't made too many black and white cards, probably because I love my paper stash so much, but I will definitely try it again. Happy New Year everyone!! My mother collects cross stitched Santa figurines and she has a beautiful collection which has really taken a life time of needlework to create. 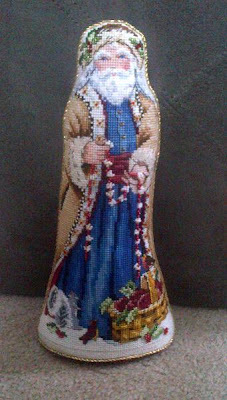 I made this figurine for her this past Christmas and he has made wonderful addition to an heirloom collection. He stands 13" tall and is 3 1/2" at the widest point of the base. His beard and fur are stitched from fluffy wool floss, and the picture does not show it but he's crusted in beading and metallic floss. Cross stitch seems to have fallen out of favor amongst crafters lately, but I'm hoping for a resurgence! It is a wonderful, relaxing art form and if I can persuade anyone to try it or return to it, I will!